Syrian army forces have uncovered new caches of British and US-made munitions, including machine guns, sniper rifles, anti-tank missiles as well as mortar rounds, used by foreign-sponsored Takfiri militants in the country’s southwestern provinces of Rif Dimashq and Quneitra. 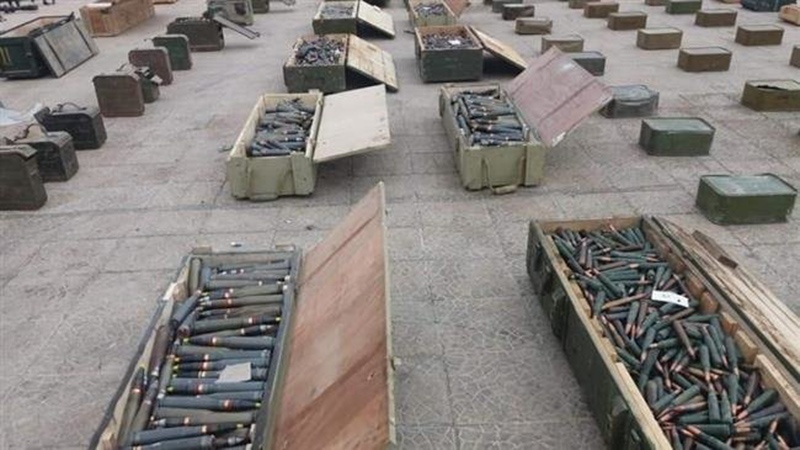 Syria’s official news agency SANA reported that the munitions were uncovered in the towns of Beit Jinn and Jubata al-Khashab, thanks to cooperation between authorities and local national reconciliation committees. The discoveries included US-built sniper rifles, TOW rockets, US-made anti-armor shells, machine guns, anti-aircraft installations, crates of bullets for heavy machine guns, mortar shells and telecommunications equipment. A wide variety of imported medical and laboratory equipment, ranging from electrocardiography machines to tools for a dental clinic, were also among the findings. Syrian government troops launched a clean-up operation in the town of Yalda, located on the southern outskirts of Damascus on October 14, and uncovered a huge cache of Western and US-made ammunition and explosives carefully hidden inside a plastic water tank at a local farm. NATO-standard sniper rifles, a LAW portable anti-tank weapon, thermal and night vision equipment, grenades, improvised explosive devices, multiple RPG launchers, Kalashnikov rifles and Dragunov sniper rifles were among the items found in the operation. Takfiri militants are thought to have hidden the weapons at the farm earlier this year before leaving the area to the troubled northwestern city of Idlib. On May 4, Syrian army soldiers discovered Israeli-made weapons, including chemical warfare, digital equipment and drugs, destined for foreign-sponsored Takfiri militants and Daesh terrorists in the country’s central province of Homs as well as Rif Dimashq province. The Arabic service of Russia’s Sputnik news agency reported that the ammunition and explosives were found in the southern part of Homs, located 162 kilometers (101 miles) north of the capital Damascus. They were meant to be distributed among anti-government extremists groups.